A few months ago I started fishing the North Crow Reservoir on and off. I have never had much luck and only brought home one or two rainbow trout each day, if I was lucky. I have had much better luck at lakes closer to town but I was determined to figure this lake out. North Crow Reservoir is one of the more remote lakes in the area. Iâ€™ve rarely seen another soul there fishing despite the lake being full of splake, grayling, and rainbow. In fact, in 2011 a 13.6-pound splake was pulled from the depths of this reservoir making a new, and still standing, state record. Neither the rising trout nor the prospect of a record-breaking fish could do anything other than add to my frustration with this lake. Bright and early one Saturday morning I grabbed my creel, rod, and waders and hopped in my truck. 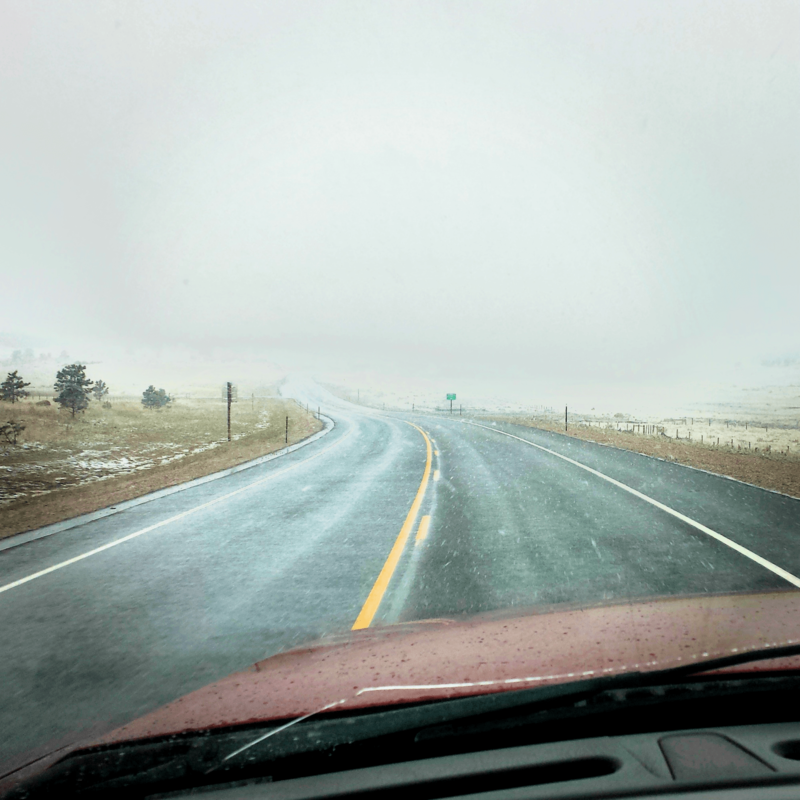 I made my ascent up from Laramie to the top of the pass and I began to see fairly dense fog in my headlights. It wasnâ€™t until I parked that I realized this fog was a light rain. That light rain became a full on down pour. In Wyoming we are known for our quick evolving weather so I decided to wait a while for the weather to change. Â Sure enough, about 10 minutes later the rain let up. I quickly seized the moment of opportunity and I threw on my waders to hit the water. Well, being in Wyoming, 10 minutes later the weather changed again. The wind picked up and the innocent droplets or rain turned to sinister icicles slicing through the air. A slush of water and snow was dropping down through forty mile an hour winds. To top it off, my old waders were leaking like a sieve. About 20 minutes later I was officially the coldest I had ever been. In my mind, I was just one cast away from leaving. Then I would cast. Then I was just one more cast away from leaving. Then after that cast I was just one, well maybe two more casts away from leaving. Maybe it was the onset of hypothermia or just the stubborn nature that many of us sportsman possess which kept me there waist deep in the lake in the freezing cold. I realized that this was right where I was supposed to be at this moment. Thereâ€™s something about challenging yourself and overcoming the elements that make every moment worth it. I could be asleep in my bed right now with the heater going and a warm cup of coffee waiting for when I wake. Then I wouldnâ€™t be here right now with a line in the water and numb fingers. Just then the stimulator on the end of my line shot underwater as a fish took the chironomid I had sunk below it. I set the hook and the tip of my 6-wt shot towards the water. After a brief fight, I slid the rainbow into my net and stuck him on the stringer. Then another, then another and then another, before I knew it I had a full stringer. Like I said, I could have easily stayed home or turned around as soon as I saw it begin to rain, but I didnâ€™t. I made a small sacrifice to my level of comfort and it was rewarded with dinner for my roommate and myself. Next time the weather turns or you hit the snooze, stay persistent, stay just a bit longer, make a sacrifice to your comfort, and you will be rewarded. Man, I am glad I came across this. I have struggled to get even a bite out at North Crow in the two times we’ve been out there (probably about 10 hours total). Only thing I’ve caught out there (shore fishing) so far is a suckerfish, and I’m pretty sure that’s only because I went a little far experimenting with my weight placement, out of frustration, and ended up dragging bait along the bottom. 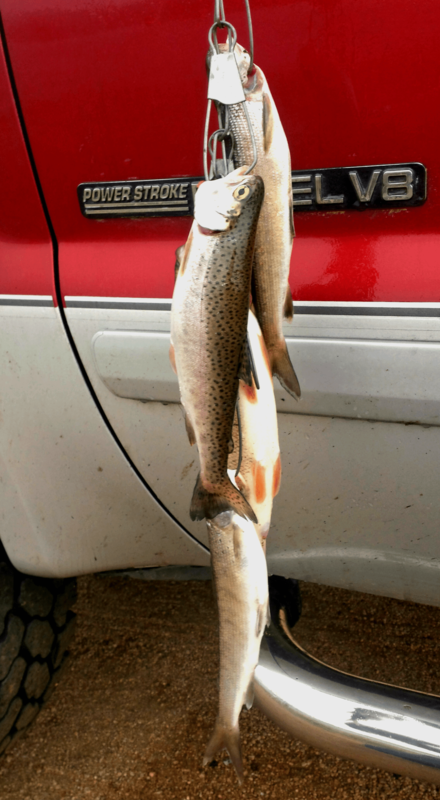 I can’t find any stocking reports, and very few specific fishing reports other than that state record splake. I’ve been beyond frustrated with this lake. We actually made the decision last week to just give up until we had confirmation of stocking or something.